HMD is working to expand its smartphones lineup. It already has three budget-mid range smartphones which are Nokia 6, 5 and 3 and it also has one flagship device named the Nokia 8. 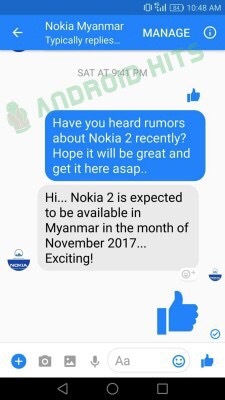 According to Nokia Myanmar’s Facebook account, the new entry-level Nokia smartphone will launch sometime in November. This information is for the Myanmar launch, and there’s no indication that it will launch sooner elsewhere. The Nokia 2 phone switches to on-screen navigation buttons, while all the others models have capacitive keys. This way you don’t lose surface area from the already small 4.7” screen. According to rumors, the Nokia 2 will be powered by a new and light Snapdragon 210 chipset – it is a slow processor. But a whopping 4,000mAh battery will make this ideal for old-school folk. According to Roland Quandt, this will not be the only new Nokia phone to launch before the end of the year. With any luck, that will be the rumored Nokia 9, which also promises to have on-screen buttons but also a bezel-less design. In short Nokia is expected to release is least expensive and most expensive Android smartphones this year.